Keen on having lots of babies or anticipate a Brady Bunch blended family situation with a house chock full of kids? Here’s a taste of what to expect when you buck the trend and have 4, 5 or even (gasp!) 6 or more kids. We’re talking a seven seater, mini van or people mover – depending on how many belts you’ve got to buckle. There is no way a standard car is going to cut it anymore (even if you have several of them), because there are going to be a lot of times where only one parent is available to chauffeur the crew. Unless you can afford a huge house with lots of space, your digs are going to be super crowded. Multiple children will need to share bedrooms, the queue for the bathroom will be long, and piles of washing, dirty dishes, toys and homework will be EVERYWHERE. There will also never be a moment of peace and quiet – and you thought just one tiny voice calling for Mummy every two seconds or two siblings fighting was bad enough! More children = more mouths to feed. You will become the crazy lady with 2-3 trolleys full of groceries who spends hours in the supermarket each week, not to mention hundreds and hundreds of dollars. And then you have to unpack it all. Imagine how much food the brood of Octomom (pictured below with just some of her 14 – YES 14!! – kids) rip through daily? Even if you run the house like a full-on military operation, it’s likely your brain will turn to mush as you struggle to call kids by the right name, remember who has a playdate and which one has a doctor appointment. Parents with only one child can struggle with this sort of stuff anyway, so unless you’re some kind of Wonder Woman, expect things to get a bit hairy. There’s no time for fussy eaters in a large family, children are lucky enough to simply get enough grub on their plates. Same goes for what clothes and toys they want – they’ll get what they get. What about petty fights like who licked whose arm? They’re not going to be heard because when you’re a parent with your own army, ain’t nobody got time for that. Unless you’re loaded like the Jolie-Pitts, money is going to be TIGHT. This means buying in bulk, accepting hand-me-downs from friends, less gifts at Christmas, no regular family meals out, not a lot of holidays and none of the latest gadgets or expensive jewellery. Looking after a house full of kids is seriously time consuming, even if you don’t work. 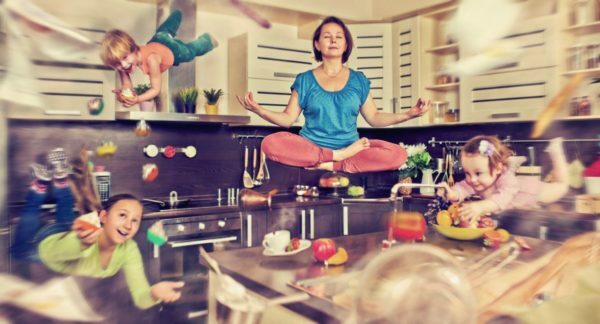 So unless you have the help of a nanny or housekeeper, you’re going to find it pretty difficult to get things like chores done, have one-on-one time with each child, monitor all the homework, listen to their various troubles and get them to all the different appointments and activities. And you can pretty much forget about date nights or me-time. Imagine multiple children all at different ages and stages – a newborn waking for feeds, a toddler with night terrors, a tween with a fever. And even if they’re all amazing sleepers, you’ll still be up late every night making lunches and folding laundry. Just hope you get enough sleep to function and rope your partner in on all the chores. You will be hard pressed to find a good sitter when you have more than just a couple of ankle-biters. It’s a big task after all, even for family members! And if you do find one chances are they’re going to charge more than the standard rate – adding even more on to your already bulging outgoing expenses. So unless you have a couple of teenagers or older kids in the mix who can help look after the younger ones, then going out could be a bit tricky, at least for a while. Yes a lot of kids might be a handful, but there will also be a whole lot more love in the house. And just think, one day they’ll be all gone and you’ll wonder what you ever did without all the noise. Don’t worry though, it won’t be long before the truckloads of grandkids start arriving! Do you have a big family? How do you manage?